A Letter From The City of Paris | What Would The Founders Think? This post requires some background information to appreciate. We hope you’ll bear with us, because we think it’s some interesting history that you’ll find nowhere else. We ask that you travel with us back to the time when steam eclipsed sail as the means for moving passengers and cargo over the world’s oceans. It was a great improvement over dependence upon wind and tides, but not, as you will read, without its own set of hazards. And yes, there is a tie in to our theme, even if it is a bit of a stretch! Our excuse is that this blog is about history and the real people who made it, and it doesn’t get more real than this small slice of the past. When the steamships City of New York and City of Paris were built, they were the largest vessels ever constructed, except for the Great Eastern. The City of Paris was the first vessel (1889) to cross the Atlantic in less than six days. It is her 1890 voyage that is the topic of this post. City of Paris was launched seven months after City of New York and began her maiden voyage on 3 April 1889. A month later, she won the Blue Riband with an average speed of 19.95 knots on the first westbound voyage under 6 days. However, on March 25, 1890 City of Paris was steaming towards Liverpool when her starboard propeller shaft broke, causing the starboard engine to race and then disintegrate. Fragments pierced the hull and the bulkhead causing both engine rooms to flood. Fortunately, the ship’s extensive subdivision proved successful and she was not in danger of sinking. However, City of Paris was dead in the water and was towed to Queentown by the tramp steamer Aldersgate. It was ultimately determined that the accident was caused by failure to synchronize the engines, a common problem with early twin screw express liners. The City of Paris was out of service for a year undergoing repairs. Below is a letter from Walter Summers to his mother, Mrs. C. A. Summers of Burlington, Vermont. 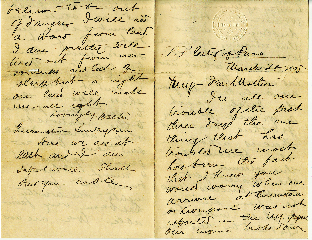 What makes this letter special is that it was written on board the ship during the events described above. It provides a unique insight into the time and what the passengers experienced. 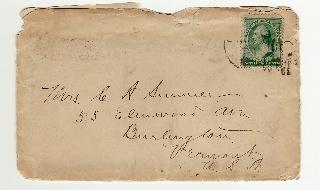 It has a $.02 George Washington* stamp postmarked April 8 6am 1890. INMAN AND INTERNATIONAL STEAMSHIP Co. LTD. around the edges of the circle and INMAN LINE in the center of the circle. I wish there was some way by which I could let you know what splendid weather we are having. For then, you wouldn’t worry about me. Thursday there was not much wind, but there was considerable (????) swell as a result of the storm which was a heavy snowstorm in New York City and about 3/4 of the people on board were sick. I was one of them. Although I sat on a deck or in the library where I now am all day. But, I couldn’t eat anything and didn’t try to do so until yesterday (Friday) noon. Since that time I have been gaining very fast and unless we strike a big storm I intend to make up for lost time and get even with the company before we get to Liverpool. Yesterday and especially today have been delightful days with very little wind and what there is is directly behind us and everybody is sitting out on deck with no wraps on and it is as warm as July day at Cedar Branch. This morning we met the first steamer of the voyage and we were so near that we could see the people. Captain Watkins said she was from Antwerp to Philadelphia. Seasick passengers are fed a bark tea. It was the first thing I had yesterday morning and it tasted good. The table is good, though I hear considerable complaints that the variety of things is not so good as on the German steamers. My first breakfast this morning included oatmeal, boiled eggs, very tender steak, fried potatoes, buckwheat cakes and oranges and it was but a small fraction of what was on the bill of fare. I ordered these things because they were about what I get at home. For lunch we have at 1230 o’clock: soups warm and cold, meats, fish, and pastry. At dinner (6:00) there are two kinds of soup, several kinds of roast meat, three or four kinds of game, puddings, pies, ice-cream, fruit etc, etc. The bills of fare are printed on board and I had one of the stewards take me down to the printing office last evening. It is down in the steerage. He prints a small paper and I furnished something for it. I have been down there again this afternoon and shall visit him again Monday when he prints the “City of Paris” gazette. This is a veritable floating palace with library and every convenience imaginable. My stateroom is well ventilated and I have it above two bunks and a sofa, plenty of water, etc. etc. You want to travel by the Inman Line when you come over. You see I am beginning to work out that 25% reduction in my fare already. We have just seen another steamer at a distance but I don’t know what it was. We have taken a very southerly course so as to avoid icebergs. If you will look up on the map on the 40th parallel, you will see where we ran until 7 o’clock this morning. It was a straight line for Madrid Spain. When we reached 50 degrees longitude we turned and are now headed direct for Liverpool. We left Sandy Hook lightship at 6:36 pm Wednesday, and tomorrow, Thursday make 307 miles. Then to noon Friday, 440 miles, and to noon today 448 miles. This is not the 510 that this steamer can do, but it will bring us into Liverpool at Wednesday. Will write you again tomorrow. The steamer will (??????) that it was almost impossible to write so I didn’t try. Everybody seems to be writing for we are due at Queenstown tomorrow about 8am and Liverpool in the evening. Even now I am writing under difficulties for the tables are all occupied and I am writing on a newspaper in my lap. We have had no storm only a steady roll of the steamer. I can stand that first rate, but I don’t like the pitching of the ship which bothers me. Thursday I am half inclined to think that I shall stop at Queenstown and go through Ireland to Glasgow and Edinborough, Scottland and then down to London without going to Liverpool. A fellow on board who rooms with Walter Catlin a year in Chicago thinks of doing it with me. If so we won’t get to London until the first of next week. Last evening some of us attended a concert given by the second cabin people in their dinning room. Every day has been pleasant and I have been awakened every morning by the sun shining though the porthole in the room which I have alone, being on the south side of a steamer going this way. I have met several very pleasant people on the trip, but I am not fond enough of the sea to wish the journey to continue much longer. In fact I am quite ready to land. I hope you are improving, but I suppose I won’t hear until I get to Paris. I wish now that I had told you to send the first letter to London, but you see I didn’t expect to go through Ireland. One of the weeks I am to be away is gone. I would like to look in on upon you and take you out to ride with Bess. You must go out oftener and keep me informed how you are when communication is once established it will seem better, although there will be some time between the time the letters are written and received. 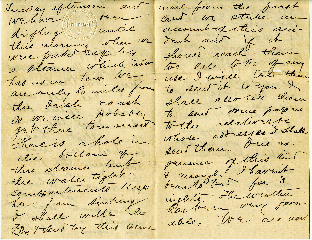 Here Walter’s writing loses some of it’s neatness and becomes a bit harder to read! This is understandable as the ship lay sloshing side to side for 3 days before the SS Aldersgate took her in tow. In all our trouble of the past three days the one thing that has troubled me most has been the fact that I know you would worry when our arrival at Queenstown or Liverpool was not reported in the New York papers. Our engine broke down Tuesday afternoon and we have drifting until this morning when we were picked up by a steamer which now has us in tow. We are only 80 miles from the Irish coast, so we will probably get there tomorrow. There is a hole in the bottom of this steamer but the water-tight compartments keep her from sinking. I shall write the ??? press and send by this same mail from the first land we strike on account of this accident and if it should reach then too late to be of any use, I shall tell them to send it you. I shall also tell them to send some papers to the relatives whose addresses I shall send them. One experience of this kind is enough. I haven’t been to bed for 3 nights. The weather has been very favorable. We are now ?? ?? ?? to be out of danger. I will add a word from land. I am pretty well tired out from nervousness and lack of sleep. But, a sight of land will make me all right. Here we are at last, and I am safe and well. Shall send you cable. We couldn’t help but share this with our readers. It’s a little bit of first hand history that sent us to the search engines. There is much more than we can share here about the interesting history of the City of Paris. 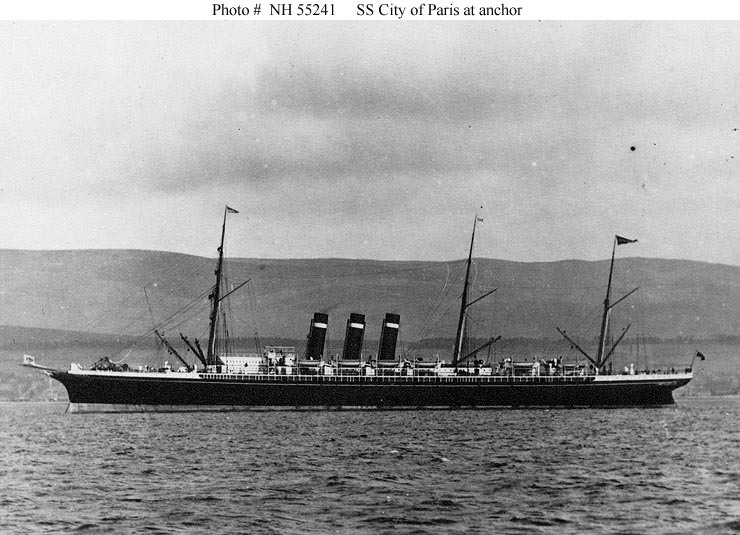 The British built passenger liner, City of Paris was part of the Inman Line. It held the Blue Riband as the fastest ship on the north Atlantic route from 1889 to 1891 and again from 1892 to 1893. It was the sister ship of the City of New York. The Inman line was in competition with the famous White Star Line. City of Paris proved to be the fastest 2-screw ship of her time. In 1886, the UK flagged Inman Line became bankrupt and was taken over by its largest creditor, the Philadelphia based International Navigation Company. The firm’s Vice President, Clement Griscom immediately sailed to Liverpool with a commitment from the Pennsylvania Railroad to provide $2 million in capital towards the building of a new ship to compete against Cunard and White Star. Scottish shipbuilders were suffering a recession and proposed construction of two identical ships at the discounted price of $1,850,000 apiece. The Pennsylvania Railroad agreed to finance the second ship that became the City of Paris. Six years earlier, Inman returned the City of Rome to her builders when she failed to meet the contract’s performance guarantees. At 8,500 GRT. the original design for …the City of New York and the City of Paris was only slightly bigger than City of Rome,(were built with) but with steel hulls instead of iron. The final designed called for ships almost 25% larger at 10,500 GRT. To address the vibration problems of most liners of the period, the new Inman liners were given a ratio of length to beam of 8.3 to 1 as compared to the then common ratio of 10 to 1. The hull was more extensively subdivided than previously attempted. The ships were equipped with a full double bottom and 15 transverse bulkheads that reached the saloon deck. They also received a fore-aft bulkhead over their entire length. Power was supplied by two triple expansion engines of 9,000 indicated horsepower each that were placed in separate compartments. While the engines for the two sisters were identical, City of Paris produced 1,500 more horsepower.The ships were the first express liners with two propellers. Single screw liners were prone to shaft failure that forced them to return to port using auxiliary sails. With the introduction of twin screws, liners were more reliable and no longer needed sails. The new Inman “Cities” are still regarded as among the most beautiful liners to ever cross the Atlantic. The plan included City of Rome’s classic clipper bow and three raked funnels. Designed for 540 first, 200 second and 1,000 steerage passengers, luxuries included hot and cold water, electric ventilation, and electric lighting. First class public rooms, such as the library and smoking room, were fitted with walnut panels and the dining salon had a massive dome that provided a natural light to the passengers. And according to Walter Summers, the bill of fare was as sumptuous as the ship’s decor. Yet, all her sumptuous appointments would not have mattered had that bulkhead given way. Summers’ letters, which somehow survived to be read by us 121 years later, might never have been delivered. Renamed Paris in 1893 after the merger of the Inman Line with the American Line, she later served the US Navy as the auxiliary cruiser Yale during the Spanish American War. After returning to civilian service she was rebuilt and renamed Philadelphia. She sailed for the American Line until requisitioned again during World War I as the troop transport Harrisburg. After the war, she resumed civilian service with the American Line until 1920. She was scrapped in 1923. *Our tie in to the Founders theme! What can one add? One of a pair of the most beautiful ships ever conceived and with a magnificent history full of adventure and heroism. As America slips into mediocrity, it’s so tempting to dwell on the past, a time represented by these ships that were so magnificent, when America was ascendant and had its greatest glory still to come. Whatever your politics, it’s plain to see that something drastic has to be done. Maybe there will someday be a new awakening into a time such as when City of Paris graced the seas with power and beauty. 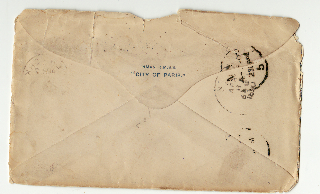 Thanks so much for your webpage concerning the SS City of Paris, and especially the copy of Walter’s letter for my Great Great Uncle Frank Hayward, was the ‘editor’ of the Paris Gazette. He had been trained in the newspaper industry and as a boy I could not quite believe that ships such as this would have a crew member who was not a sailor; now I understand so thanks for adding a bit more to my understanding. I have a model he built of the ship though its not quite to scale.